Join a more athletic class, challenge your body by focusing on alignment and balance. Learn to link movements with breath while improving endurance of the entire body. 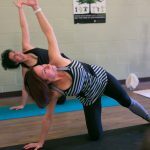 Advance your yoga practice in this class while focusing on the core and all the major muscle groups. In this class you will become more bodily aware and relaxed.